In My Humble Opinion: The new Poltergeist remake serves as another nail in the coffin when it comes to the idea of movie remakes. Don’t get me wrong, the idea isn’t completely dead and there have been a few remakes that proved it can be done, and done well. Unfortunately for every Cape Fear or Nutty Professor type remake that succeeds, there is a mass of Total Recall, Red Dawn, Halloween, types that unseat my confidence in the whole idea of remakes. Poltergeist, unfortunately is another remake that not only shows how bad remakes can be, but just how bad movies themselves can be. Poltergeist stars Sam Rockwell (which is part of the reason I was hoping this movie would do well, he’s awesome!) and Rosemarie DeWitt as married couple Eric and Amy Bowen. When we first meet the couple and their three children, the family is in the process of buying a new home. Amy doesn’t work and is contemplating on writing a novel, while Eric has recently been laid off from his employer. Hopefully, after reading that, you’re thinking the same thing I was when I watched the movie. Neither parent is working, but they’re buying a home? What is this, the great market crash all over again? Anyway, if you’ve seen the original then you know the basic storyline. 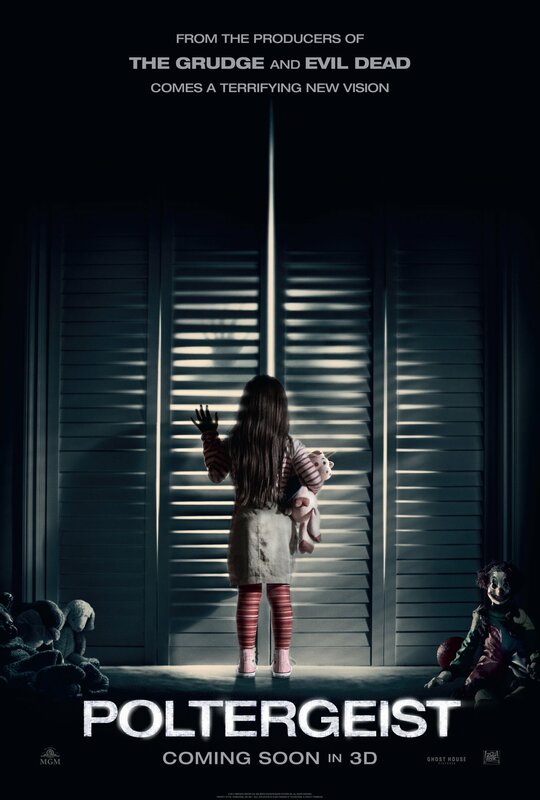 A poltergeist begins terrorizing the family, all in an attempt to kidnap the youngest of the Bowens, little daughter Caroline so she can lead all the tortured souls “into the light.” Although in this version the youngest daughter’s name is Maddison (Yeah, cause that will surely distinguish this movie from the original). Spooks and scares ensue, or least that’s what I think the filmmakers were trying to do, before an expert is brought in to save the Bowen family, yada yada yada. Forget that the movie is a remake for a second, and you still find yourself thinking, “God, this movie is just really…bad!” Never mind the fact that the movie doesn’t deliver up a single scare; the writing is all over the place with no real continuity leaving you with a feeling that the movie was being mapped out as it was being filmed. As far as the performances, the actors themselves seem to be disappointed with the fact that they agreed to be in the movie in the first place. The most evident aspect of this is Sam Rockwell. The normally engaging and magnetic actor is dulled down to a morose, sad sack father with no real passion whatsoever. All in all, the movie was a huge disappointment and the only thing haunting about the movie is the fact that it was ever green lit in the first place.